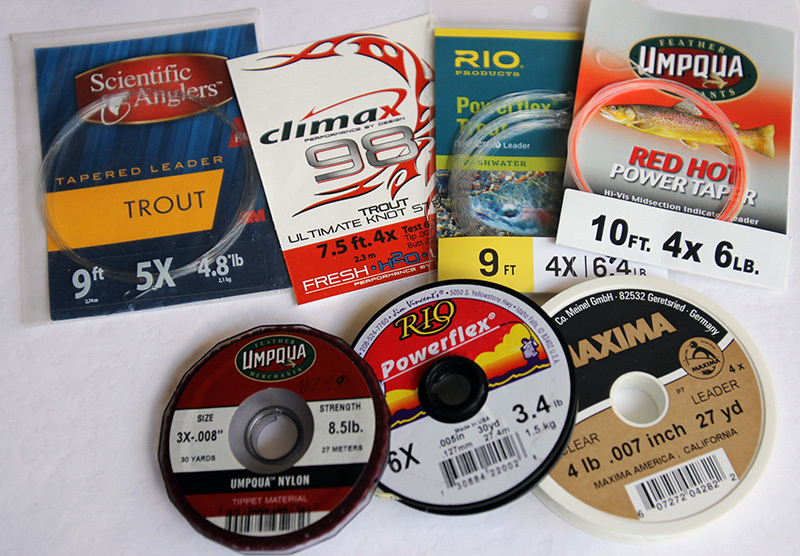 Leader materials for the fly fisherman. Fly fishing methods are as varied as the number of anglers. If you examine any of these methods you realize that no matter what the method, there is always a thing called a “leader”–which is the all important connection between the fly (the part that catches the fish) and the fly line (the part that delivers the fly to the fish). There are many fly fishers who will spend $400.00 or more for a rod, $100.00 for fly line, who knows how much time and effort to get to a fishing location and think nothing of it. Little thought may be put into the fact that much of their success depends on a $4.95 piece of monofilament. If it is not treated properly and performs perfectly, everything else is meaningless. I know many fly fishers who just don’t respect their leaders (in a fishing sense, not a political one). Last year while fishing for steelhead every solid hook-up ended with the loss of the fish. Even though both of the anglers were using material from the same spool, one had success and the other did not. Everything was examined. The cause was not the leaders but a tiny nick on one of the rod guides. A change of rods solved the problem. The clue was the fact that using a long leader would lead to a breakoff close to the boat and the break was always in the upper part of the leader. I rarely loose a fish because of leader failure. When I do loose one, it usually is because of knot failure. Here are some tips that lead me (pun intended) to make that statement. First, if I am nymph fishing, catch a large fish or recover from a snag, I check the leader and tippet regularly by running my fingers on the leader, especially the part two or three feet up from the fly for any abrasion or “nicks”. Trout and other fish have teeth that can abrade a leader. The act of fighting a good fish can drag your leader over an abrasive surface and lead to line failure. If it doesn’t feel right, I replace the leader. Secondly, if I’m just taking a break I check the leader more closely for wind knots or kinks. You can do all of this checking by simply running your fingertips up and down the leader a few times. Third, I use a reliable knot for the fly to tippet connection. A reliable knot is one you can tie well under most fishing conditions and you have confidence in using. Fourth, find a brand of leader material that suites your fishing style and use it consistently. Manufacturers put a lot of effort into making good leaders. You will quickly learn which one works well for you. Actions like those above do not take a lot of time to implement. Incidentally, a final suggestion is to check your hooks carefully. I recently ran across a batch of hooks that had eyes with a larger than normal gap and allowed the hook to “slide” off of the tippet. Also check the hook eye for nicks or burrs. I bet you didn’t think of that one. Above all, a consistent approach to careful treatment of your leader will build your confidence when it is your time to land the big one. Tight Lines. Je demande un avantage injuste.